I’m in my Father’s place. The Weather App on my iPhone, not wishing to be precise, locates me at the North Atlantic Ocean. 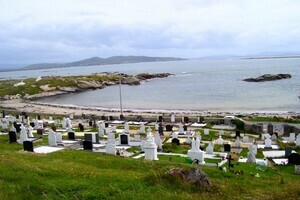 It’s Arranmore Island off the coast of Donegal. I’m here for a family gathering. Not a wedding nor a funeral, just a once off occasion to share time with those with whom I have a genetic imprint. My uncle, the eldest surviving brother since my Dad passed away, is King of the Island. It’s a honorary title but it does allow us to wallow in a pretence of being a ‘royal’ family. Our being here coincides with the marking of other events. The primary school my Dad went to was opened one hundred years ago. Peadar O’Donnell, the radical socialist when that term meant something, taught there. He would still have something to say about people, place and dignity. In the Seanad, in an act that some might say abused my position, I argued for retention of the one teacher twelve pupil school, I was glad that for once I seemed to be listened to. A second occasion being marked is the sixtieth anniversary of the evacuation of the adjacent much smaller island of Inniscarra. A village street structure there stares poignantly up at its still inhabited bigger brother. The name of the island comes from the Irish ‘Island of the Sheep’. That’s just what it is, no irony, no overworked analogy. Arranmore exists through the kindness of strangers. Strip by strip islanders have been denied the means to better provide for themselves. They can’t fish, there are few fish left. They can’t grow as the peaty soil doesn’t allow for it. There is some livestock. Only tourism offers some capacity. Employment is exported to the mainland and beyond. Family life becomes a weekend activity. One of the skills that has been developed is that of tunnelling. Gangs of men from here have been linked with key infrastructure projects such as the Channel Tunnel. My Dad used some of the accumulated expertise when he worked as a dynamiter at an uranium mine in Canada. My Mother told me only recently how he had been approached by ‘the lads’ to use his skill to help ‘the cause’. It seems he took great satisfaction in telling his hopeful recruiters what he thought of their cause and what they were doing to realise it. What Arranmore needs, what all islands need, are the tools and infrastructure of the 21st century. This is the Digital Age where in theory work can be done from anywhere. Being perched on one leg with my iPhone out of a window isn’t exactly the ideal working environment. Other countries, like Denmark, take the idea of sustaining island life more seriously, putting in place programmes to achieve those goals effectively. For island life we can also read life in rural towns and villages. There continues to be no real spatial policy in this country. A bloated Dublin continues to vacuum life from the rest of country. I’m tempted to summon up my Dad’s dynamiting skills for some more creative purposes. That would, at least, give me another reason to remember him. Fifteen years ago this month he passed away. While letting nature take its course he seemed to plan his passing. He spent his last three months on the island arranging for all his grandchildren to visit him. When he lapsed into a coma after his third bout of cancer in twenty years, he was transported across the island on hay on a tractor and trailer. The island’s ambulance being repaired at time. Micheál Martin was then Minister for Health. I was so angry at him because of that but eventually realised it had nothing to do with him. Besides he had his own reasons to grieve my Dad’s death. It was Letterkenny General Hospital where my Mother and I had to decide to switch off his respirator. Cork where he was buried. His soul we knew stayed on the island. It’s what and why we go to visit. 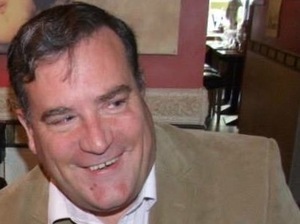 Dan Boyle is a former Green Party TD. Posted in Misc and tagged Dan Boyle, Dan on Thursday at 9:41 am on August 6, 2015 by Admin. Spell it right lads. Proof-reading is what grown ups do. Thanks Medieval Kneviel, corrected now. Now fix the “once off” thing. Uniquely Hiberno-English affliction. What’s wrong with it? I understood that just fine. DB means ‘one-off,’ which doesn’t meant the same thing as ‘once-off’. Once off is what I meant. It may happen again. Not after the way you behaved at it, it won’t. Nice bit of writing from Dan. The bolding of certain parts is unnecessary. I find it interesting that in one sentence Dan has a go at the Ra and a couple of sentences later is talking about creative dynamiting of dublin. Talking about spending vast amounts of money to set up communications infrastructure on islands that are inhabited by so few while the country goes through a horrible recession is a joke, it is a great example of Parrish pump politics, I like visiting the Blaskets and have never had issue getting signal even had 4G last year so can I recommend changing network instead of recommending another wasteful government program and you know maybe use that money in healthcare which Donegal certainly could use. I disagree the idea that ensuring broadband coverage is wasteful at all. Also that spending on critical infrastructure during a recession is a bad Idea. Particularly infrastructure that will allow people to participate in the workforce without massive social upheaval. I also disagree with your implication that something is a certain way on an island in Kerry so it must be that way on an island in Donegal. You really think supplying broadband to an isolated island is more important then you know giving them a decent health service? There is also satellite broadband for people in isolated communities. But wasting what would certainly be millions to turn an isolated island into some sort of commercial hub is ridiculous waste of resources. Satellite broadband is beyond $hite! Dial up is more reliable. Yup. I find it’s good to stick to your guns and not be as changeable as an Irish politician on your principals. I prefer to stick to my principles…. Broadband is this centuries rural electrification. The to hell or to towns model doesn’t cut it. Work patterns are evolving and Ireland needs to redistribute it’s workforce across the Island. Dublin is creaking and companies need to be encouraged to move West. Ubiquitous high speed broadband should be a vote clincher at EVERY parish pump. Sort of like decentralisation, and that worked so well. No. Nothing like decentrallisation; more like rural electrification. Dublin is not really creaking although it needs investment. Work patterns do seem to be changing but not moving away from cities but precisely the opposite. City cores everywhere are being revitalised. China is giving up on attempts to limit the growth of Beiijing, the UK are pumping everything they have into London. It’ll be great consolation when all your mates are living in cities and city-states around the world that them feckers in Dublin don’t have nothing than we don’t get down the country. Its fine to want urban services in a rural environment but would he support the building of communications masts and wind farms on the island to provide him with these services. Broadband coverage is not an Urban service. Interesting but he is completely wrong. In Ireland, we have spent too much time spreading resources thinly rather than investing in three or four large centres. Cities are where most economic and cultural life happens. Dublin is not competing with Letterkenny, it is competing with Amsterdam & Singapore and Dublin is not even that big on a global scale. When we emigrate, we don’t emigrate to the equivalent of the Blaskets or Aran Islands, we emigrate to cities – to London, to New York, to Boston, to Sydney, to Berlin. The big missing policy of the last few decades has been the promotion of vibrant, dense, well-serviced urban centres. Arranmore to the U.S. was to a place called Beaver Island in Lake Michigan. The large current exceptions would be Western Australia (even still clustered around Perth) and some remote parts of Canada. They are temporary and once the resource goes, the population goes too. So from Wikipedia, it looks like fishing and logging brought people to Beaver Island until, ‘A steep decline in the fish population in the 1940s led to the exodus of most of the island’s residents’. There has apparently been a reurgence in population due to tourism but as of 2010, 657 people lived there (1300 on the Aran Islands). We need cities. I am all for utilising a bit of creativity to enable those who want to live somewhere like the Aran Islands to live there but let’s stop arve the cities in order to fund services for those living an essentially suburban existence in the countryside. Thank you, genuinely, for responding. What can’t Ireland compete with Amsterdam and Singapore? I hope that we can but it is a constant process. We could certainly do with better city government – both in terms of the competence of the council(s) and in terms of the importance given to Dublin on the national stage. Me me me me. Me, me me me me me me and me. Also, me me me me my standing in the community, me me me me me me. Royalty petty snobbery fake modesty reference. Then me me me me me and of course, me. That’s what I read too…. I don’t get these Dan Boyle posts at all…. I’m not saying get rid, just I don’t get…. I hate to say it Mr T. but I agree with you on this. It’s observational it’s meant to be written in the first person. Have been asked to contribute and am pleased to. It’s written as an alternative to a journalistic piece. It creates a response, even if some responses are predictable and unthinking. It’s nothing more than that. I’m sorry I didn’t realise I was corresponding with the Dalai Lama. …easy mistake Dan..but there is one essential difference…Mr.T. probably contributes to your pension and the Dalai Lama definitely doesn’t. Ah the pension. I’d be happy to swap incomes. It’s also my pleasure to have contributed to yours also. Train spotting is prett good, though. He is right. People still don’t grasp the concept of being a country after 100 years of independence. Denmark? It’s a figment of liberal imagination, not a country. The countries are Boston, Bondi Beach, Alberta and Croydon. And Chinese could sure give us a good price for them useless but expensive to keep islands. Almost sounds like his anger has gotten the better of him and I can understand why. The whole speech is a meandering wander into all sorts of areas. His anger is correctly aimed at the appaling health services that we have here . …the irony is that the response to a medical emergency on Arannmore is probably better and quicker than most places on mainland Donegal. To be honest mate Im not too sure! Is tehre response times anywhere? …have a relation who lives on one of the islands…no GP but a district nurse…a helicopter will come at her request and take the emergency to the most appropriate hospital not just the nearest. I suppose it’s borne of frustration that he was never given the opportunity to push for a better service and less waste of money. I mean, like, he seems like a clever, industrious sort of guy who could have contributed ideas if there was ever, say, a Minister of Health or someone like that he could have spoken to. Managed to get into the Senate as Bertie Ahern’s nominee. Political achievements: None. Unless you count his efforts in keeping the most inept government ever in power. Kudos to you Mr Boyle, kudos. Do you agree or disagree with the article and the points within? Why does it matter whether Boyle was a sufficiently competent and trusted politician to be elected? Would you be elected? Would Bodger be elected? I don;t think I would be elected. Where is Broadsheet going with all these op-eds from the likes of Mr. Boyle and especially the weekly novella from M. Mercille ? If you must post such items, perhaps you could just give the gist of the opinion in a head and link it to the article. Thus saving me having to scroll past and losing my rag. I don’t usually agree with the Boyle pieces but they are (imo) much more balanced and interesting than Merceille’s long-winded recitations of opinions as fact. Enda Kenny makes me want to puke. Dan Boyle completes the task. So, a man with cancer retires to die on an Island he loves and his son complains that there was no ambulance to bring the dying man to a boat to bring him to a hospital. If he was living in Dublin this wouldn’t have been a problem. That’s me told Ollie. My Dad went to die so he could inflict maximum damage on the health service. Your family must be proud. Well, at least we can tick off that Broadsheet bingo card square we have for when the subject of a post defends themselves in the comments. Apologies if I’ve breached site etiquette. There had been a number of negative posts from the same source before I responded. I like when the author gets stuck in btl. I enjoyed this. Interesting and honest. Stopped reading at Dan Boyle. Greens and their hypocrisy make me sick. And why does BS give this failure a platform? Stoppit, Dan is a lovely bloke. He’s a little bit naive, but you knew that when you read ‘Green Party’.